It all started with a custard cream. They are, clearly, the epitome of biscuity indulgence. Two sweetly crunchy – but not too crunchy – layers; pale yet tasty, like a Swedish beach volleyballer at the start of the season, they dreamily sandwich the cream, that moreishly off-yellow, enticingly soft yet strangely brittle, layer of vanillary squishy goodness. And I had eaten the last one. This wouldn’t have been too bad, but all that was left were digestives, some broken and the odd rich tea. I had, unwittingly committed a cardinal biscuit sin. Oh! If only I had been more observant; less hawkish about spotting and gobbling down my prey, the embarrassment could have been saved! Diversionary tactics. That was my only option. “I’m not sure why everyone is so upset. They’re not the best biscuits anyway”, I ventured combatively, tentatively prodding the conversation for weak points. “Hob Nobs beat custard creams hands down. Chocolate ideally, but they don’t have to be”. “No! No!”, a cacophony of disagreement washed my way. Success, I imagined, was mine. But no. “You can’t change the subject. You’ve taken the last custard cream. We probably won’t invite you again”, said John. “Mind you..” he paused. “…at least you didn’t take my all time favourite. I do like a … Lemon Puff”. 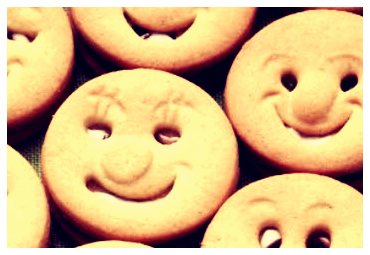 Waves of biscuity nostalgia rippled out. The Lemon Puff. Flaky and crumbly on the outside, with a wash of transparent, crunchy icing sugar to bite through and between the layers, a tart, sharp lemon middle. “Yes! They are amazing! I haven’t had them for years!”. “Marks and Spencer” chimed in Mrs P. “That’s where you get them from”. “But they’re no good for dunking”. “Urrrgh! No! How can you dunk? It’s a crime to biscuitness!” Mrs W just pulled a face. Her position was clear. “Anyway” added Mrs P, ignoring dunking slight, “I like Jammy Dodgers”. “Are you sure you’re not thinking of Happy Faces?”, added John. They’re jammy and creamy. Good for dunking and eating alone” he added with a conciliatory wink. “My all time favourite biscuit? Well it’s a polariser”, I said. “Fig Rolls. But not the ones that have been cut off. They have to have the folded ends, almost like they’re fully enclosed.” The response made it clear that Fig Rolls could not vie for biscuit leadership. Too many nay sayers. Too many heretics yet to see the Light. “Which Nice though?” quizzed John instantly. “The standard one, or the one with a layer of granulated sugar on top? It has to be that one. The other reminds me of my Nan. Or….” he paused, “..it could be the thin one with a layer of cream in the middle”. It all ended with a Custard Cream. It always does. Mind you. Good job no one mentioned Jaspers.